That first cry when your world topples over with joy. That first smile that beams brighter than sunshine. Your baby deserves the best and that is when Dabur’s Baby Massage Oil with Olive and Almonds comes soaring through. Don’t be too surprised when you see him walk in no time or ask for frequent massages and bubble baths. Strengthens bones and muscles and helps in their rapid development. Perfectly moisturizes baby skin to keep it feather soft. Its non-greasy texture allows it to wash away with a mere light bath. Additional Information :Dabur India, is the world’s largest Ayurvedic Natural Health Care Company. They pride on a legacy of excellent quality and experience. The Dabur Baby Massage Oil with Olive and Almonds comes in with a promise to becoming your baby’s favorite mode of pampering. Explore the entire range of Massage Oils available on Nykaa. 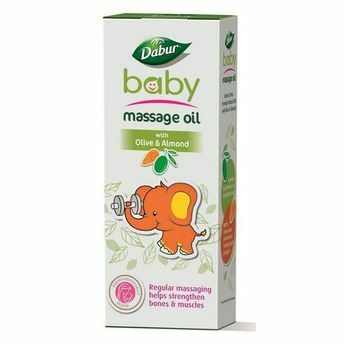 Shop more Dabur products here.You can browse through the complete world of Dabur Massage Oils .